How Do Wild Birds Keep Cool in Summer? During the most sweltering summer days or heat waves, birders may worry about how birds will keep cool. Wild birds, however, are well adapted to hot climates, and they have both physical and behavioral characteristics that help them beat the heat. Birds have a naturally higher body heat than many other creatures. While optimal temperatures vary for different species, the average bird has a body temperature of 105 degrees Fahrenheit (40 degrees Celsius). Furthermore, birds' high metabolic rate and active lifestyle generate even more body heat that must be controlled if the bird is to stay healthy and cool. On hot days, birds have several ways to regulate their body temperatures to keep from overheating. Physically, birds have evolved to adapt to different temperature ranges, and their behavior can also help them keep cool. Respiration Rate: Birds have rapid respiration rates that allow greater heat dissipation through regular breathing, even without panting or opening their bills. Bare Skin: Bare skin patches on the legs, feet, and face to allow greater heat loss than if every area were covered with feathers. Even small patches such as a fleshy eye ring can help dissipate heat. Some birds can even swell those patches to increase the surface area if they are hotter and need to cool off more quickly. Bill Size: Some tropical birds, most notably toucans, have large bills with a rich blood supply. On a hot day, the birds can increase the blood flow to their bills to help release heat. When the temperature cools, that blood flow slows, and heat is retained within the body instead. Panting: Just like dogs, wild birds will open their bills and pant to help dissipate heat on a hot day. As they get hotter, their panting may increase in speed, or they may open their bills even further for greater cooling. Activity Level: Birds will adapt their daily activities to suit the climate. On a very hot day or in warmer climates, birds are less active during the hottest hours and more active when the sun is lower and the air cooler. Seeking Shade: More birds can be found in shady areas during the hottest times of the year, particularly near water sources and low to the ground. The more layers of branches and leaves above the ground, the more heat will be absorbed and the cooler the shade will be. Soaring: Birds of prey often soar at higher altitudes on the hottest days. While this does not get them out of the sun, the air temperatures are much colder at great altitude, which keeps the birds cooler. 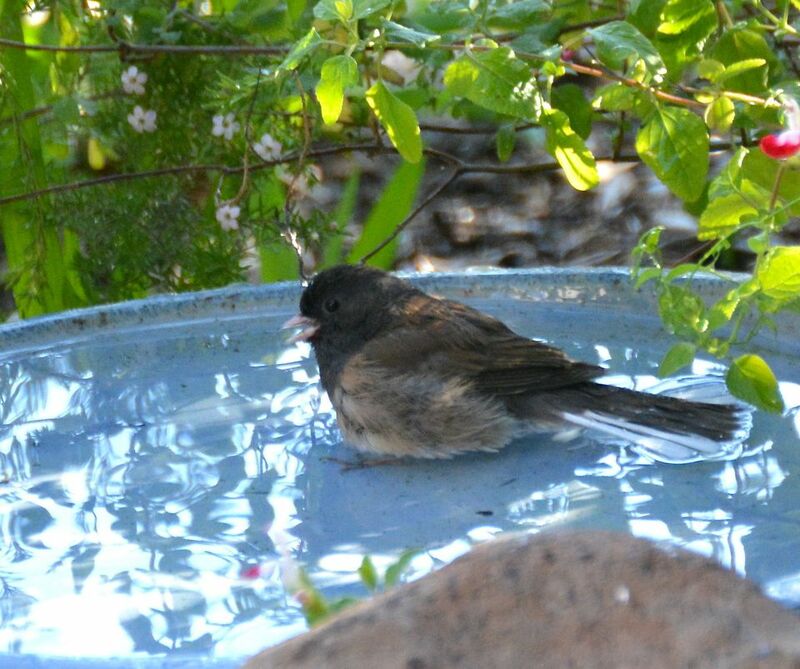 Bathing: Many backyard birds and songbird species will bathe in hot weather to cool their bodies with water. They may simply walk through the water or shake it over their bodies with head twists and wing flutters. Waterfowl will frequently dive beneath the surface to get thoroughly wet in the heat. Spreading Feathers: When a cool breeze provides some relief from the heat, birds may puff out their feathers or flutter their wings to let the circulating air reach their hot skin. They may also hold their wings away from their bodies to lower their body temperature. Urohydrosis: Some birds, most notably vultures, will urinate on their bare legs to take advantage of evaporative cooling. The white residue from their urine and feces can also help reflect more sunlight to keep them even cooler. Less Solar Radiation: Birds with lighter colored plumage may turn their lightest parts toward the sun on a hot day, so more heat is reflected away from their bodies. Breeding Range: Many birds migrate in relation to their preferred climates, and when the weather is warming up they will seek cooler locations at northern latitudes. Similarly, birds in mountainous regions may head for higher, cooler altitudes, while birds in lowlands retreat into deeper shady, sheltered areas. While wild birds have many ways to keep cool even on the hottest days, conscientious birders can easily help their backyard flock avoid the heat. Use Bird Baths: Provide a birdbath filled with clean, fresh water for birds to drink and bathe. The depth of the basin should be no more than 1-2 inches to accommodate even small bathing birds easily. On the hottest days, this water may evaporate quickly, so check regularly to keep it filled or take steps to keep the basin filled even without monitoring. Consider Misters and Drippers: Moving water with audible splashes and visible sparkles will act as a billboard to passing birds that a refreshing drink or bath is available. Some bird species, such as hummingbirds, prefer misters or drippers instead of deeper bird baths, and providing multiple water sources will ensure all the birds can keep cool. Create Shady Landscaping: Plant native trees and shrubs at several levels to provide plentiful, deep shade and shelter from the hot sun. Make your bird-friendly landscaping do double duty by also choosing plants that will provide natural food sources for backyard birds. Avoid pruning trees and bushes in the summer when birds need the cool shelter the most. Shade Accessories: If you provide bird baths and bird feeders in your backyard, try to position each one to be protected from the majority of the midday sun. Even if it makes the accessories less visible from the air, the birds will soon find them and will frequent them much more during the hottest seasons. This will also help keep food fresh and water free of bacteria or algae growth. Ventilate Bird Houses: Every bird house you have in your yard needs adequate ventilation holes under the eaves or at the top of the walls so cool air can circulate inside the structure. Young birds have very poor temperature regulation abilities, and it is easy for chicks to smother in an overheated house. Painting birdhouses light colors can also help reflect heat and keep them cooler. Provide Good Food: By providing birds a nutritional food source through a clean, well-stocked feeder, they will not need to overheat themselves seeking food on hot summer days. Opt for seeds that will not spoil quickly and try avoiding suet and other fat-based bird foods that can quickly go rancid during the summer's heat. Clean feeders regularly to keep them in good condition, and offer nectar-rich flowers, berry bushes for birds and other familiar, naturally-renewing food sources. Birds have many ways to keep cool even on the hottest days. Birders who understand how birds regulate their temperatures can find birds in the field easier and provide a more suitable backyard habitat to attract them all summer long. Ever Wonder How Wild Birds Keep Warm in the Winter? How Do Birds Fly? It's More Than Flapping! Where Birds Go At Night, Anyway? How Do Birds Lose Legs, and How Can You Help? Why Is Preening So Important to Birds? Why Do Birds Take Dust Baths?